but at him being no 1 search. Heath Ledger's ex-fiancee Michelle Williams has denied she was set to accept any awards the late star wins for his role in The Dark Knight. Ledger's performance as The Joker - the last movie he completed before his drug overdose death in January - is expected to earn him a clutch of posthumous prizes during the forthcoming awards season. He is already nominated for the Best Supporting Actor Golden Globe, and is hotly tipped to become the first posthumous acting Oscar winner since Peter Finch in 1977. Williams - the mother of Ledger's daughter Matilida - was thought to be among those contending to accept awards on her ex's behalf, along with his father Kim. But the Brokeback Mountain actress won't be involved. Her representative says, "No discussions have been made for Michelle to accept nor are there any plans to take part." Over on the MSNBC website today they have a big "slideshow" feature depicting in memorium portraits of celebrities and important public figures who have passed away this year. 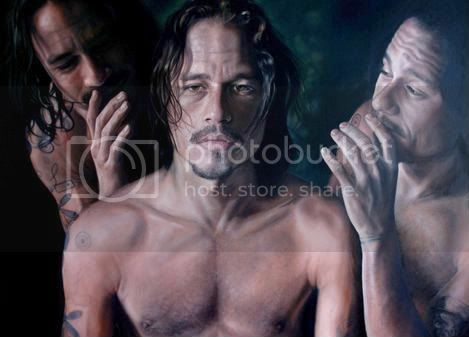 Of course, Heath is part of this set of portraits. That's why, when he died, it was as if half of the world had collapsed. Make that a massive thankyou from me too, Bruce. Very hard to read Gilliams words re Heath.I wonder how long the hurt goes on for. I feels such a silly old fool at my age. Heath just touched many raw nerves, while simultaneously, starting a healing process and delivering to me the most wonderful friend, I dd not even know I was looking for, until she arrived. His words about angels remind me of the Robbie Williams track which I so love.